How do I figure out where to start? What resources help newbies vs. more experienced users? How do I select a good problem to tackle? How do I operationalize a solution and sustain it over time? I am hopeful that the combination of real-world case studies plus the detailed articles I have done in the past will be a helpful guide for people on this journey. Please read on for more of the back story and learn how you can help. People find themselves in a position where they need to solve a fairly basic data wrangling task and reach for Excel as that solution. Excel is really not an ideal tool for the solution but it is the only one many people know. Frequently the Excel “solution” evolves and grows over time into an unmanageable mess. Python plus pandas is a really good solution to this problem. 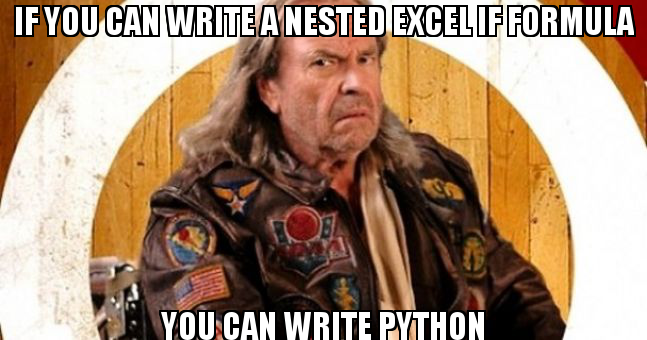 If someone can build a super gnarly excel formula, they could probably learn to code python. One approach to solving this problem is to train the “Excel Alpha Geek” how they can use python to solve their problems in a better way. Overall, the feedback was positive and I think people enjoyed the presentation. There’s just one problem. When I asked the people in the room, “how many of you know about or use python?” The overwhelming majority raised their hand. While it is always good to speak to a friendly audience, I feel like I was probably preaching to the choir. This group mostly knew about the python solution and would be able to evaluate its application to their needs. How do we reach people that only know VBA? Getting the “python” message out to the right audience can be a challenge. Through this blog, I have had the really good fortune to speak to some really smart people that are interested in the same thing I am. Basically, they feel that there is a big opportunity to introduce python into organizations and help people accomplish their jobs in a more efficient way. They have all had the experience of seeing organizations struggle with fairly simple processes because they were stuck in the Excel mindset. Many of these people have then introduced python into their workplace and seen tremendous improvements in productivity. I have had similar experiences and here is a small example experience I had just the other day. I saw the results (which were what I was looking for) and then said: “Ok, thanks for doing this. How much time would it take for you to update this every week?” The pained look on his face confirmed my suspicions. It was probably several hours of work - based on the way the solution was built. Clearly time that he did not want to sign up for. Since this was data I had familiarity with, I used the python+pandas approach and built a ~100 line script that does the same thing in a cleaner and more repeatable fashion. I probably spent as much time on the script as he did for the Excel creation. I do not say this to boast. I say this to highlight how much opportunity there is to streamline and improve day to day processes. Operationalizing and introducing python into an organization has real benefits but it is challenging to figure out how to start. I don’t know about you but I certainly don’t work in an area where people write queries against Petabytes of data! Technology companies are built from the ground up to have some pretty awesome capabilities available to a broad cross-section of their organization. My point with these anecdotes is that there is such a disconnect between the extreme of a highly technical company like Facebook and the rest of the world just trying to do their job. It’s a huge chasm and you can not assume that a multi-petabyte database solution is going to work for someone trying to migrate away from a terminal solution or a heavily Excel-driven mindset. There is a huge disconnect between the cool, big data tools and the average organization just trying to limp along with aging IT infrastructure they have lived with for years. How do we let people know that python would be a good solution? Assuming they buy in to python, how do they get started? How do you simply and efficiently deploy python-based solutions? Regarding point #3, Wes McKinney wrote a good article about the challenges and the python communities’ opportunity to fix this. The community has made progress. It is still a challenge but I’m hopeful people will take up Wes’ call to action. I want to focus on points #1 and #2. I don’t know that I can build a technical solution but I think there may be an opportunity to share best practice with others and raise awareness of python and how it could be used to help people solve their day to day challenges. A couple of weeks ago, this thread on reddit was extremely active and illustrated the interest people had in learning about real world examples of how python helped them solve a problem. There were lots of really good ideas and lots of interest in learning more. 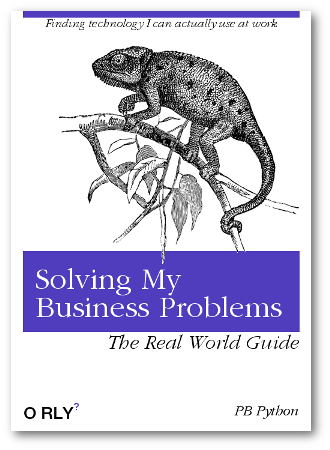 Show concrete examples of how python helped solve a real world business problem. The issue could be as big or as small as you’d like but I would lean towards solutions built by individuals or very small teams - not a massive project. You can share as much or as little as you’d like. Posting here would provide a level of anonymity (if desired). I think people are hesitant to talk about their work solutions for fear that someone will come after them. The true value might not be in the actual sharing of code but in the ideas and processes used to solve a problem and make it scalable. In many situations, the challenges are not technical in nature. I think there is a real need to spread this information out in a format that is less threatening to a non-programmer. If we could get some good case studies out there it might spark some ideas and help people understand how to tackle their own problems. If you are interested in sharing your experiences, let me know. I would be more than willing to work with you to put together as much or as little detail as you would like in order to get the word out there. This can be a small but meaningful way way that you could give back to the community. So, what do you think? Put your thoughts in the comments and reach out to me if you have any great ideas.